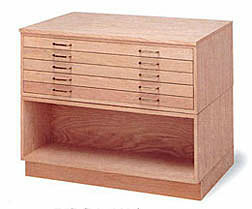 Mayline Oakwood plan files are built from Appalachian Red oak and come in a variety of stackable drawer combinations. Drawers operate smoothly on lubricated wood drawer runs. Units are finished in rich golden oak. Wood dowels align individual units when stacked. hardboard is used for drawer bottoms and 4" insert hood at rear of drawer. Hood keeps papers and drawing from sliding over back in movement of drawers. Drawers have metal card holders and solid oak drawer handles. Finished in golden oak color. 7717C - Files for Drawings up to 24" x 36"
7718C - Files for Drawings up to 30" x 42"
7719C - Files for Drawings up to 36" x 48"